The most common and often the most irritating symptom associated with menopause is the hot flash. As many as 75 percent of women going through menopause in the United States experience hot flashes with 10% to 15% of women having severe or frequent hot flashes. I had miserable hot flashes that heated up at the most inconvenient times and sometimes flaring up every few hours. I tried every trick in the book to eliminate this miserable symptom – from herbs, to teas, to exercise, to diet, to praying hourly that they would disappear – but they persisted. 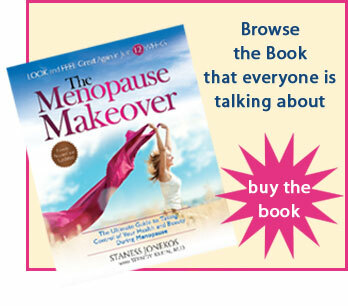 With confusing and conflicting information online and in best-selling books, I teamed up with leading menopause expert and co-author of The Menopause Makeover, Dr. Wendy Klein, to get the latest scientific information on alternative, complementary and medical options to relieve hot flashes. Understanding available hot flash options will give you the opportunity to discuss menopause management with your clinician. This interview with Dr. Klein is the first in a series that addresses the various menopause symptoms. Staness: Dr. Klein, what exactly is a hot flash? Dr. Klein: A hot flash is a sensation of extreme heat in the head and upper body generally associated with sweating. We know from studying women that the internal core temperature does increase. You can a put a sensor on the skin and before a woman experiences a hot flash she will be able to tell you, “I am going to have a hot flash.” And sure enough, there will be an increase in internal core temperature followed by profuse sweating which is very uncomfortable. As you know, the purpose of sweating is to cool the body so there is often a reflex of sort of chill that follows the hot flash. It is a very uncomfortable and distracting sensation. It can occur at any time of the day. It can occur with tremendous variability, it can happen many times an hour or only just once or twice a day. Some women have one or two hot flashes a day, and get through menopause with no problems while other women have fifteen or twenty a day. We are all different. Staness: What causes a hot flash? Dr. Klein: We are still trying to understand exactly what causes hot flashes. We know that they are related to the hypothalamus, which is in the center of the brain and acts like the thermostat for the body. What we don’t understand is why some women are so troubled by them and others are not. Certain women seem to have triggers. An alcoholic beverage may bring on a hot flash, or a change in external temperature can cause a hot flash for some women. In general, the hormonal flux or variation in hormone levels seems to be related to this sensation in some women. Staness: Are there other causes? Dr. Klein: We know that smoking is associated with hot flashes. Women who smoke have a higher risk of troublesome hot flashes, so obviously you should not smoke. Also certain medicines can cause hot flashes such as certain antidepressants SSRI, Selective Serotonin Reuptake Inhibitors, are common antidepressants that can actually cause an increase in hot flashes. Yet, for some women, a very low dose can actually alleviate hot flashes, making antidepressants an alternative to hormone therapy. Illnesses and fever can cause hot flashes, as can malignancies, and tuberculosis – many illnesses can cause hot flashes. Increased BMI, Body Mass Index, has been associated with hot flashes. We used to think that women who were heavy had excess estrogen, and therefore fewer hot flashes. Now from the major study that was done in the SWAN, Study of Women Across the Nation, we know that women who are heavy, who have abnormally high body mass index, are at increased risk for hot flashes. Staness: What’s a menopausal gal to do if she suffers from hot flashes? Dr. Klein: The real issue is how troubled are you. Some women find that they can manage their hot flashes with simple lifestyle changes, such as wearing layered clothing, lowering the thermostat, carrying a fan, drinking cool beverages, avoiding triggers like caffeine and alcohol. Some women can have a few hot flashes a day and over time, seventy-five to eighty percent of cases the hot flashes will diminish and disappear. Then there is a subset of women for whom hot flashes are really troubling and don’t go away. Lots of women have recurring hot flashes waking them up over and over again and they can’t go back to sleep. They are not getting enough rest; they wake up grouchy, tired, and sweaty. If it is really a problem, there are hormonal therapies that will alleviate these symptoms. As you know hormone therapy can have side effects, so you must always weigh the benefit versus the risk. There are very low dose hormone therapies that are now available that can be extremely useful for alleviating hot flashes. There are some other options to consider such as soy and black cohosh. The studies regarding soy are mixed, with some showing that soy can be helpful; while there are other studies that show soy may help with mild symptoms. Soy is benign and easily available and may be worth trying. Black cohosh is another herb and has been used in Europe widely, but you have to be careful because there have been reports of toxicity with high doses. Used in limited amounts in standardized doses black cohosh supplements may help some women with hot flashes. Again, there have been mixed studies, so whatever you do, and with anything you take, you should always discuss with your clinician. You can also try lifestyle changes – wearing layered clothing, practice deep breathing, meditation and yoga, exercising – all of these things that can be really helpful in learning to live with the symptoms if they are moderate. Another option to treat hot flashes is gabapentin. This is a drug that was originally developed as an antiseizure medicine. Gabapentin is widely used for pain relief, because it was discovered that with patients in whom it was used for seizures, it helped with pain. It was then found that it helped with hot flashes. Gabapentin is a reasonable alternative to discuss with your clinician if you do not want to or if you cannot take hormone therapy. Staness: I was on birth control pills for years and had no idea I was perimenopausal until I stopped them, then the hot flashes started erupting. Are birth control pills a good option for hot flashes? Dr. Klein: Birth control pills are a form of hormone therapy. They are a higher dose than standard menopausal therapy, but there is estrogen in most birth control pills and that keeps hot flashes away. If you are in the perimenopausal phase, birth control pills can also be useful for regulating your periods, plus they keep hot flashes away. Understanding the causes and solutions for hot flashes is the first step to managing your menopause. If you suffer from hot flashes, discuss your treatment options (alternative, complementary and medical) with your healthcare provider.